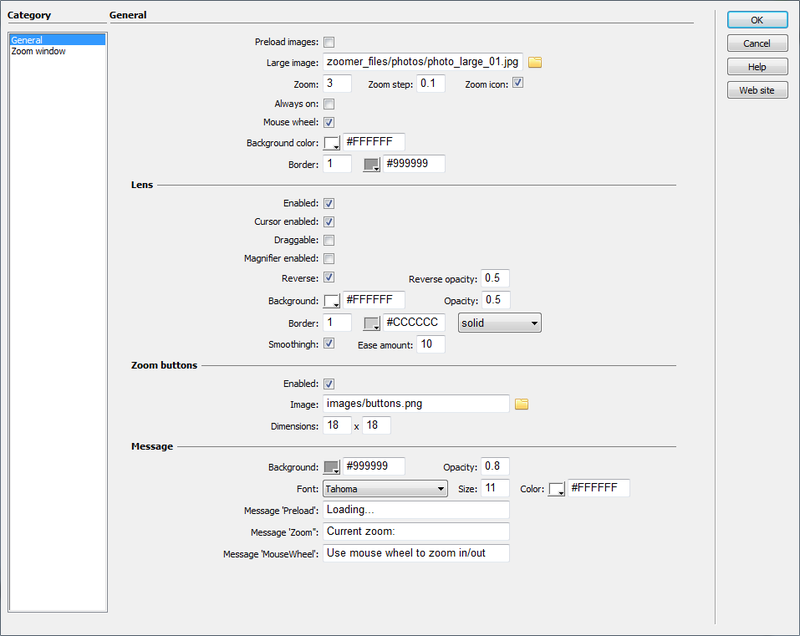 HTML5 Image Zoomer is distributed as an Adobe Dreamweaver extension, packed as a file, named JQImageZoomer.mxp. Read more in the online help. HTML5 Image Zoomer can be really useful for showing large images on your website with limited space. This is very useful if you have large images that will otherwise take up too much space. It's great to use on product images, photos, or other images with lots of details which you want show to your users. With our component you can add zoom-in functionality to any image, adjust magnifier appearance and different zoom options. Let's you view a magnified portion of any image upon moving your mouse over it. You can specify position of the popup window over your page where you want or zoom position can be inside the smaller image, useful if you want not to obscure any other content. This component also provides built-in image preloading. The magnification power can be adjusted on the fly by turning the mouse wheel back or forth. As an option you can also add your thumbs with other images to create a kind of zoom gallery. There is no need to tune it up through CSS to match your site's theme, everything is realized through User Interface, so can be easily styled to fit perfectly your site and design. Player compatible with all modern browsers, platforms and also search engine friendly. Component is ready to work as soon as it appears on a page and is fast to respond. The installation package contains Dreamweaver extension, providing you the ability to easily create high-impact, HTML5-powered zoomer, all in Dreamweaver CS3, CS4, CS5, CS6, CC 2014, 2015, 2017 and CC 2018. Using the user-friendly interface, you can adjust colors, fonts, sizes, spacing and wide range of other options according to your taste. The movement smoothness can be set to different values for a gentle drifting effect. 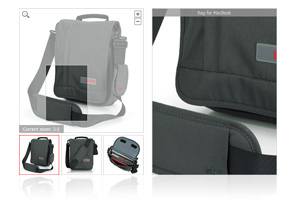 Zoom window can be inside the smaller image, in order not to obscure page content. Popup custom position, fadein and fadeout effects. Set up initial zoom level of the image and set zoom step. The user can toggle the zoom level by using the mousewheel. You can click and drag the lens to select zoom area. Magnifying lens that appears over the image lets the user zoom in on any portion of it as it follows the cursor around. Option to add thumbs in order to create even gallery. All content is easily accessible to search engines and markup is semantically correct to help you achieve the best possible SEO results. Installation package contains Dreamweaver extension. 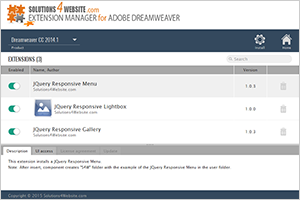 Dreamweaver extension allows you to easily create HTML5 zoomer. Extension has user friendly interface.